Wow, it’s Friday again already! This week flew by for me. Maybe because I only posted twice this week? I can tell you that did feel weird taking Tuesday off, but not in a bad way either. I’ll be back to your regularly scheduled program next week. I know you’re just dying for those 4 posts per week instead of 3 😛 I used to post 5 times a week. That seems like so much now. 4 is my happy place and since Friday is always the Finisher, it’s really just 3 posts. And at least now I can post 2 recipes a week if I want and not have to worry about “running out”, which was the biggest fear I had all during the school year. Now I have so much back-up in the recipe department…(I know I tell you this all the time, but it’s real!) Now I’ll have summer recipes still to post in the winter. Maybe I should cook flip-flop of the seasons. Winter in the summer and summer in the winter and then posting would be easier? Maybe? No. Winter produce isn’t accessible right now! Haha! Can you follow the rules? This made me feel so much better! This may actually be helpful! I was always the second best. This is the greatest, most true, analogy! I’m a believe in less is more and minimalist living for sure! Really. It’s not sincere most of the time you use it. You have the powder. Only you. These are great things to implement into you life! It’s okay if you need to make some modifications to be safe! Love these moves! Great workout! Another article reaffirming what I said. I think this is the best written guide I’ve ever read on the swing! This is a great topic of discussion! Very valid points raised for discussion! First of all, Keurig coffee is disgusting anyway! You may learn something new with these great 50 tips! All my favorites!!! Never had Saviseeds though! A very comprehensive guide! Bookmark it! I can’t wait! Soy and gluten-free too! I hope they make an unsweetened variety available! I can dry them, I just can’t grow them! These are all wonderful and very true! When you live life with your disease in the background, not the foreground. If you haven’t read/seen this (you must be under a social media rock), but it has many valid points! But then you read this response and realize this is a much better response to the above. And they have nothing to do with diet! #4 is so true it hurts! Sometimes we just have too many ideas! Have you tried it? I haven’t…yet. + What Is The Ideal Length Of Everything Online? You may find this helpful, but I still think it depends on audience as well! A must if you don’t already! These are really great to keep in mind! Great things to remember as you’re growing your social media. My whole summer is a staycation! So cool! Funny story. I HATE (can not stand) the Civil War Era hats they wore. I can’t even handle it. Just ask anyone who knows me in real life. I cringe! I’m sure you’ve seen this one in your Facebook feed too 😉 Funny stuff! 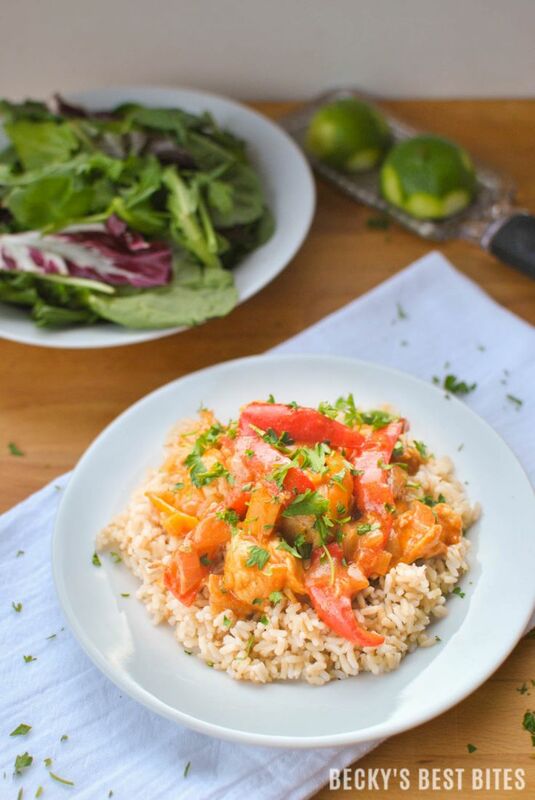 Sneaky Spicy Thai Chicken. More Thai obsession this week! 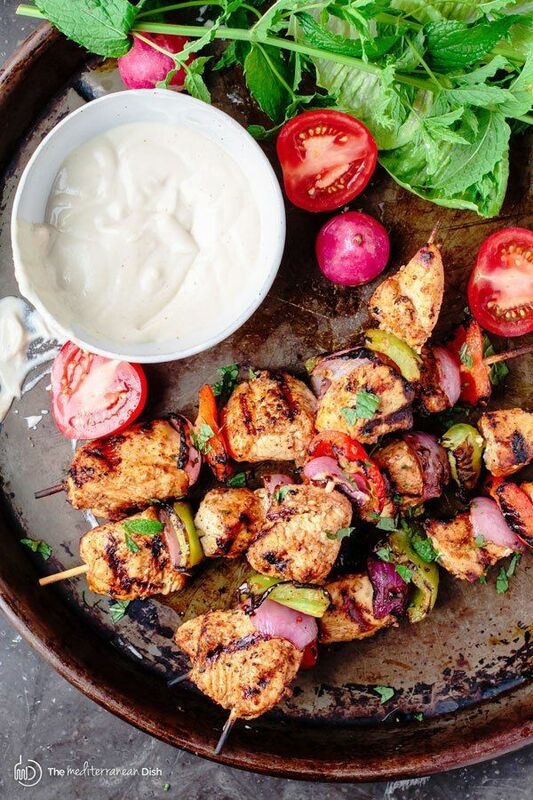 Mediterranean Grilled Chicken Kabobs + Cayenne Tahini Sauce. That sauce! Yes, please! Blueberry Honey Glazed Salmon. 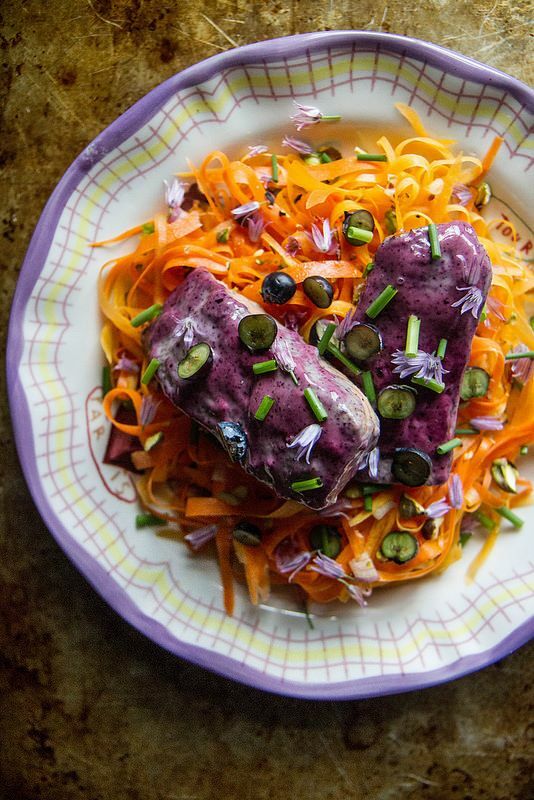 Who wants purple salmon!? Me! 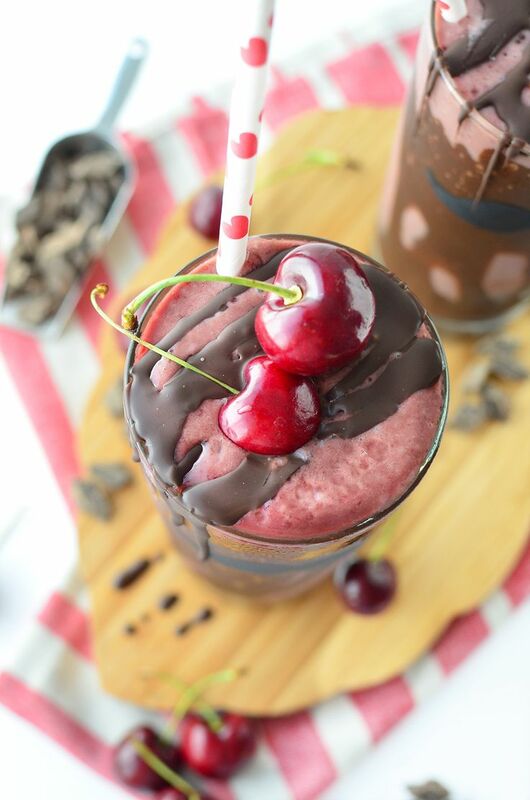 Vegan Chocolate Cherry Milkshakes. Okay…even I (Miss. Non-Smoothie-er) want this! 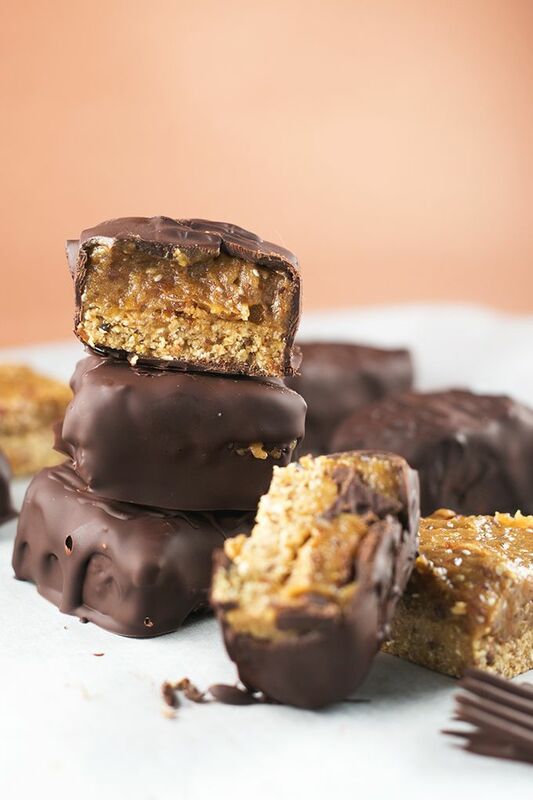 Raw Vegan Twix Bars with Banana Date Caramel. O goodness! And they’re nut-free! Yay for allergy-free treats! 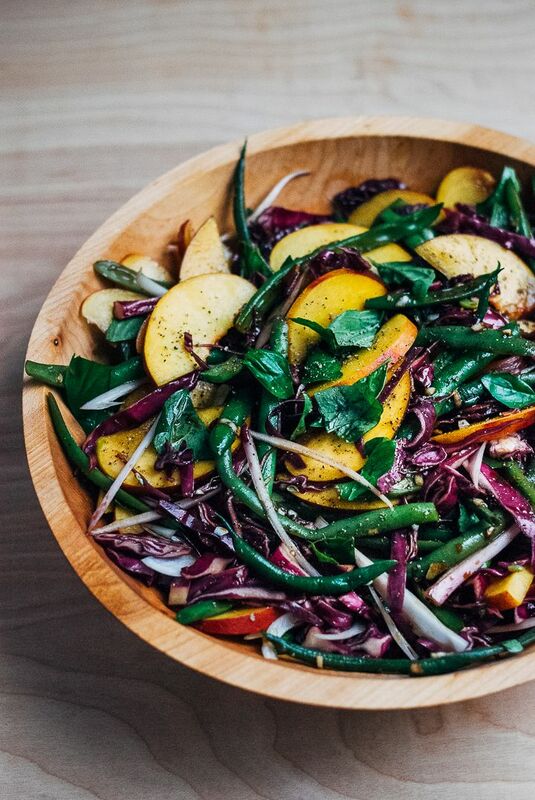 Green Bean Salad with Peaches and Balsamic Bitters Vinaigrette. This sounds amazing and looks so stunning! 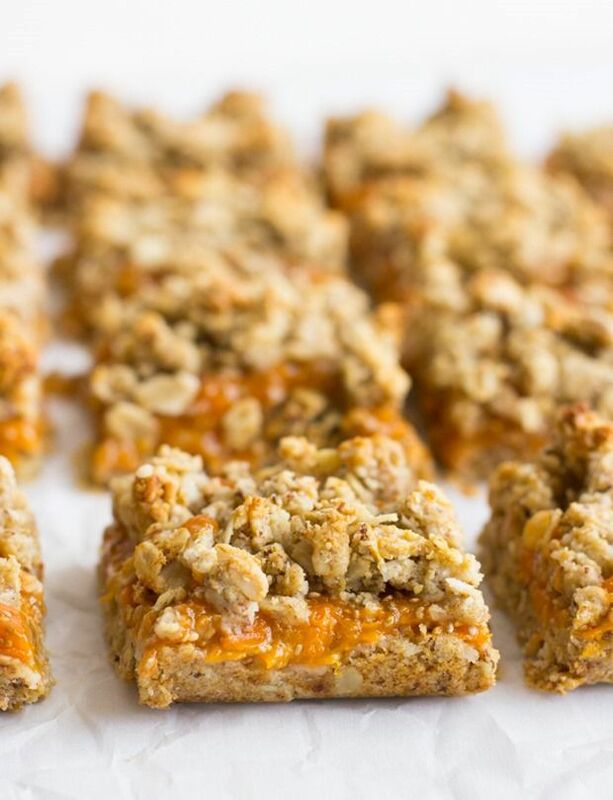 Apricot Oatmeal Crumble Bars. Fresh summer apricots are so under-utilized! 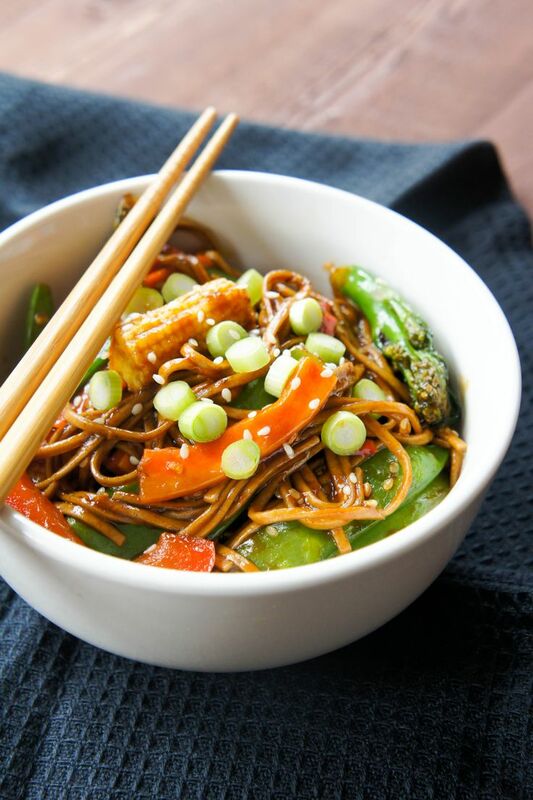 Soba Noodles with Stir-Fried Vegetables. A few tweaks and this will be perfect! 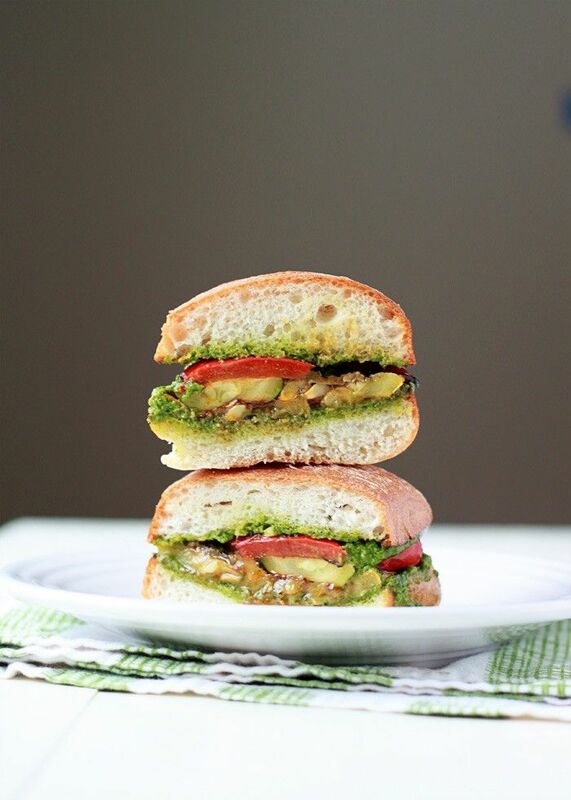 Grilled Summer Vegetable Sandwiches with Pesto. Look at that veggie goodness <3 A lunch must! + Twining’s cold brew tea bags! I forgot how much I loved this stuff last summer and now I’m addicted again! Just steep the tea bag in cold water for 5 minutes, add some ice if you want, and bam! Perfect iced tea <3 I love the green tea mint and peach tea ones! + I finished a book, started another, and got an audio-book! If I like podcasts, why not play an audio-book and get further in my book list that way? Perfect solution! Even though I’ve always been against them. I need the satisfaction of actually saying I READ the book, I don’t really care at this point! Haha! + Are you easing up on your technology time this summer? + Do you ever listen to audio-books? Love your Friday finisher. Audio books are great for long car rides…I like to use them instead of having the kids watch shows. Yes! And it’s just another great way to start chipping away at my HUGE to-read list! Love your commentary! Stopping by from the Inpsire Me Monday hop, come say hi! Summer time is usually a time for all bloggers to get off track a bit and that’s ok. We need to make time to enjoy life beyond our computers. So, have fun! Now, you certainly have a whole lot of yum going on here. 😀 Have a tunetastic week! Summer Slump is for REAL. Ugh. Even being new to blogging, I have to remind myself to STEP BACK. And live the real life 😉 But I love all the recipe links! I am working on meal prep Sunday so I can get to the grocery store and have some solid meals this week! 🙂 I’m thinking I need to try that creamy tahini dressing. It’s life telling us so STOP and BREATHE and LIVE! Tahini should be in every meal prep/plan 😉 Haha! This week has definitely flown by for me!! So glad I’m not the only one feeling the blogging slump (feeling better now that I know it’s an actual thing!!! Hope you’re having a great weekend Rebecca! It’s all good! I think we all need to just live this summer to the fullest and not worry about blogging (which is hard) but, for the best! Awesome links, Rebecca. I especially liked the gluten-free links. So true! Wow! What a great post of awesomeness from the week! Thanks so much for including my post too. I’m honored. :). The Keurig my mom and brother use, at home…doesn’t even fill a mug! It’s like 6oz of coffee, maybe and it tastes so bad! Haha! I have my own real coffee brewing pot and beans! I just can’t stand instagram and how people act on it….so fake. I’ll never say I “love” instagram as a social media platform…ever! Listen to Jamie Ivey!! Seriously, I’m obsessed with her podcasts! The summer slump is real! I am for sure easing up on technology time. I live in NJ, we have limited months where weather is appealing to me, so I try to take advantage of it as much as possible! I’m deep into my summer slacking on blogging- but definitely took the time to browse through these awesome reads before shutting the screen down for the weekend! Have a good one! The summer is a time to rejuvenate!!! No shame! I know!!! 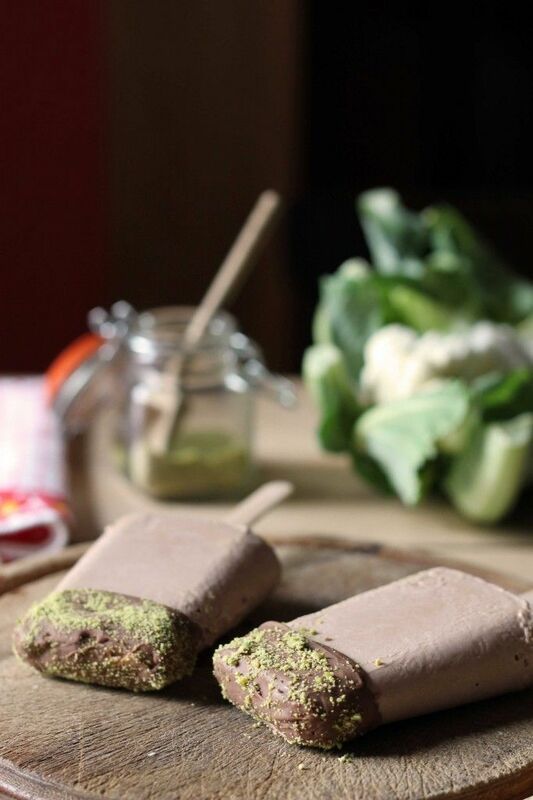 Really fabulous recipe! Those are the gems that just keep inspiring! 6! Holy Moly! no way!! I think when you blog more like “lifestyle” and aren’t a content blogger (like me) it’s easier to post everyday and even multiple times a day! Just a different form of blogging! What a round up! This is the first I’m hearing of Daiya Greek Yogurt! EEK!! So excited!! I know!!!! The wait is killing me now! Dear Rebecca, I always love Friday Finisher. Another group of great links and articles to peruse through this weekend. Ever since I won my Blendtec I’ve been saying I will make vegan cheese. Thanks for a little push. I used to hate the idea of audiobooks, thinking I needed the real feel of a book. I joined Audible about 10 years ago and I never looked back. Love audiobooks! It’s always such a great satisfaction to make homemade! I think it’s always weird when you get off schedule…I feel all out of sorts if I don’t post 5 times a week but you’re right, it’s a bit much. I think once I get back from Blogfest and get all my already scheduled posts out of the way, I am going to readjust my schedule so that I can promote the quality content instead of just promoting quantity. Yea! Quality is a lot better than quantity, but if you’re a “blogger” who posts like once a month…..that’s no good either. That’s not blogging, haha! I wish there was a summer ban on technology….everyone be forced to be out and about! um —> THANK YOU THANK YOU For the vegan cheese link. I am working on that. I need to learn more. YAY! and YUM! Yes!!! Girl, vegan cheese (homemade) is the way to go ALWAYS!